Within the Theory of Knowledge course, you will explore knowledge questions related to one or more 'areas of knowledge'. These 'areas of knowledge' are fields of study in which we try to gain knowledge through the ways of knowing. The areas of knowledge roughly correspond with the groups of study within the IB programme, even though there are some additional realms of knowledge such as ethics, religion and indigenous knowledge which are relevant to TOK. Within your TOK classes, you will also explore boundaries and overlaps between different areas of knowledge. The knowledge frameworks are useful tools to analyse the historical development, language, methodology and scope of each area of knowledge. Given that we need to make links between different areas of knowledge, it is not advisable to discuss areas of knowledge in complete isolation. The articles and links immediately below are indeed examples of real life situations which touch upon TOK questions in a range of areas of knowledge. For practical purposes, however, I have organised the resources per area of knowledge. It is up to you to explore them and make further links between areas of knowledge and ways of knowing. Doing so, will hopefully inspire you to develop interesting knowledge questions, which form the basis of TOK assessment. This page deals with religion as an area of knowledge. “The whole point of knowledge is to produce both meaning and purpose in our personal lives.” To what extent do you agree with this statement? (May 2015). “Metaphor makes no contribution to knowledge but is essential for understanding.” Evaluate this statement with reference to two areas of knowledge. November 2016). The classification of religion as an 'Area of Knowledge', just like the inclusion of faith as a 'Way of Knowing' can be disputed. Even though most people recognise that religion plays a vital role in the lives of many, atheists will probably question to which extent religion or faith can be sources and areas of knowledge. Nevertheless, one should understand that many peoples and cultures have organised their lives around religion. Religion aims to answer some of the bigger questions in life, such as the reason for our existence, human suffering, and the universe's mysterious ways. There are several views of religion. Theism claims that the universe is created and ruled by a powerful, omnipotent God. Amongst the major world religions, Judeism, Islam and Christianity are examples of Theistic religions. A Panthesistic view of religion, on the other hand, draws on the notion that God is everything and everything is part of God. Hinduism, Buddhism and Toaism are Pantheistic religions. Agnostic knowers neither accept nor deny the existence of God or a higher reality. They are conscience of their 'ignorance', which is an interesting point of view from a TOK perspective. The issues of proof, validity and rationality in religion, lead some people to take an Atheist stance. 'An Atheist denies the existence of a creator God and believes that the universe is material in nature and has no spiritual dimension.' (Lagemaat, 2011). Regardless of your stance on religion as an Area of Knowledge, one cannot deny that religious knowledge is highly dependent on one's knowledge community, which is in its turn influenced by individual and shared memory, language, and emotion. Religion plays a substantial role when we make value judgments and faith is an invaluable Way of Knowing when we analyse Religious Knowledge. Logical positivists argue that true knowledge can only be obtained through empirical or logical/linguistic verification. Logical positivists are skeptical of theology, as there is no place for it in their empirical, logical and linguistic theory of knowledge. Even though one might argue that empirical justification is irrelevant in the context of metaphysical knowledge claims, the issue of religious proof, validity and justification remains critical to many knowers. If we look at the Ways of Knowing, would you claim that religion is a matter of imagination in order to fulfill a psychological need? Or does faith intrinsically not require proof? Are faith, intuition, language and emotion Ways of Knowing that lead us to Religous Knowledge, regardless of what empirical evidence or reason seem to show us? Kant opposes a rationalist and empirical understanding of God whilst arguing for a metaphysical and moral approach to religious philosophy. His is often contrasted with Hume in his view of religion and morality. the Atheists claim that faith and reason cannot be reconciled and according to Freud, religious faith is an irrational wish fulfillment (Lagemaat, 2011). Are advances in science irreconcilable with religion? Does the Theory of Evolution annihilate Creationist claims? Are paradigm shifts in the last 2000 years proof of confirmation bias of the religious knowers or atheist knowers and the knowledge communities they belong to? Finally, the incredible variety of religious beliefs, both currently and historically, may lead some to doubt the absolute nature of religious truth. Religious pluralism explains this diversity as different aspects and 'guises leading to the same truth. Ethically, this position seems acceptable, but it may also lead to some philosophical and theological paradoxes. A human basis of religion? Atheists often point out the problems with anthro-pomorphic interpretations of God within most (institutionalised) religions. If you believe in God, do you think of God in terms of gender? Ethnicity? Does your God resemble a human being in any way? If so, does your God belong to your 'knowledge community'? Why? 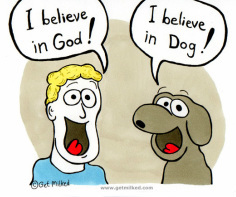 If Dogs would believe in God, what would their God look like, according to you? It is indeed very difficult to think of God in terms that are completely unrelated to our physical world. What is the role of anthropomorphic analogies in religion? Is true religion unrelated to our physical experience, given that it deals with metaphysical issues? If so, is there any point in 'believing'? One could argue that we see what we want to see and see what we see from a human perspective. Michael Shermer explores some anthropomorphic interpretations of visual stimuli at TED. Yet, should the problem of anthropomorphism automatically lead to skepticism in the field of religion? Somewhat related to the anthropomorphic interpretations of God is the importance of human experience in the context of religion. Some people go through intense religious experiences at some point in their lives and some have described something similar when going through a 'near-death experience'. Other believers claim to have witnessed miracles. These miracles often influence the faith of other believers and they have been described in religious texts. Hume refutes the notion of miracles and many philosophers have tried to steer away from an all too human interpretation of God. But, as pointed out below, this can lead to paradoxes. Is it possible to think about God without resorting to anthropomorphism? 'Some philosophers paint God as an 'omnipotent (all powerful), omniscient (all knowing) and omniamorous (all loving) creator of the universe' (Lagemaat, 2011). Yet, such concepts may lead to religious paradoxes. The paradox of omnipotence is the most widely discussed. But also concepts such as suffering (particularly relevant to Christianity) could seem paradoxical. If Christ died to relieve suffering in the world, why is there so much suffering? If God is omnipotent and does aim to relieve suffering, why is the world as it is? Richard van de Lagemaat also discusses the 'paradox of change' and the 'paradox of free will' in his course companion. The paradoxical nature of religious philosophy certainly provides much food for thought: entire courses at top universities in the world are devoted to its discussion and analysis. Mater dolorosa: the suffering mother as common 'theme' in Christianity. Religion and the natural sciences. A case for scientific proof of god? Intelligent design, pastafarianism, and the natural sciences.